Join us for an experience of your life! Visit the magnificent Andalucía, its three major jewels, the cities of Seville with its Cathedral, Córdoba with its Mezquita, and Granada with the Alhambra Palace, and its beautiful and romantic countryside with several National Parks. 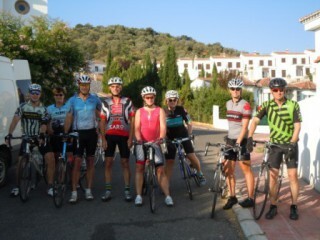 Ride through orchards, olive groves, sunflower fields, and cork trees plantations, pedal on its most famous Vía Verde (Green Road) over former railroad viaducts and through tunnels, view the gorgeous peaks of the Sierra Nevada and other mountain ranges, and spend a night in a cave hotel in Guadix. See a Flamenco performance and acquaint yourself with the production of olive oil. Last but not least, try some of the best tapas in the country and local speciality drinks such as Sangria and Vino de Verano (Summer Wine). You will see a country where Jews, Muslims, and Christians lived together in relative peace and tolerance. This cohesion bore many fruits and architectural gems. You will experience a different way of life with the renowned Spanish siestas, laid back attitude, lively cities, tapas, and Spanish hospitality. You will experience the best of the Moorish and Christian culture, especially in architecture. We believe that after this tour, Spain will remain in your hearts forever and that you will want to return to this country that has so much to offer to its visitors. 9 nights lodging in selected hotels and pensions. Breakfasts every morning and 5 delicious dinners (one drink included). Tour guide and ride leaders en route. Walking tours and sightseeing in Seville. 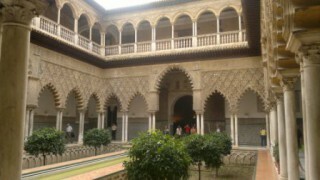 Visit to the Mezquita in Cordoba, and the famous Alhambra in Granada. Visit to an olive oil museum or mill. We strongly recommend that you extend your stay in Seville in the beginning of the trip and in Granada in the end of the trip by at least one day in each town. After you check-in (for those who are just arriving), we will regroup at the hotel reception for an afternoon walking tour of Seville, this magnificent, historically rich center of Andalucía. A lot could be said about this gem of first Muslim taifa (kingdom) and then Christian Spain, but let’s just say that it is probably the liveliest city in Spain and one of the most “addictive” cities in the entire world. You will discover its many charms on our tour. Rental bike fitting and other bike assistance will be provided before and after the tour. In the evening, we will meet for a welcome dinner and orientation meeting. After breakfast at our hotel, we get on our bikes and ride in a group out of the city using one of its bike paths, heading north towards the beautiful National Parks of de la Sierra Norte. After about 20 km in flat terrain, the roads become rolling and eventually hilly. We ride through several small towns where you can get the first taste of what a small Andalucian town or village looks like. 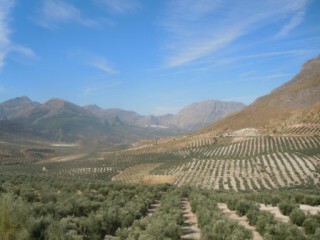 Prior to entering the National Park, we pass cattle farms, orchards, fields, olive groves, and cork tree plantations. Today’s destination is the typical “mountain” town of Constantina (elevation 555m) in the heart of the National Park. We spend the night here in a small, quiet hotel on top of the town with views of the local ruin, a former Islamic fort. The first half of today’s ride takes us through the National Park of Sierra Norte and its small charming towns, with some really spectacular and breathtaking views of the area. When we get down to the valley of the Rio Guadalquivir, we ride on small rolling roads through some of the many local olive groves and sunflower fields. We follow the river all the way to Cordoba, where we cross the famous Roman Bridge towards the even more famous Mezquita Cathedral. Our hotel for the next two nights is located just a short walk from this magnificent architectural gem that reminds us of the times when Muslims, Jews, and Christians lived side by side in tolerance and respect, enriching their city with their cultures, skills, and customs. After breakfast, we visit the Mezquita Cathedral. You have the entire afternoon to explore the narrow, charming streets of this fairy-tale like city of Andalucía, its historical center, and many of the city’s famous patios and courtyards, which homeowners use as a seasonal living room. People in Cordoba take pride in their courtyards and often leave the doors to them open, so everybody can admire these small gardens in the city. Visit some of the many tapa bars and taste their excellent Spanish wine and famous Andalucian tapas, do some shopping, and visit the Arab Spa (Baños Árabes). For dinner on your own, you can choose from many excellent restaurants in the city that serve, besides other food, the best of Andalucian cuisine. After breakfast, we cross once again the Roman Bridge and say goodbye to the ancient and at the same time modern city of Cordoba. Today’s ride takes us on small curvy and rolling roads through sunflower fields and olive groves. You also have the opportunity to explore the charming center of Castro del Rio, a small town on our route. Our destination today is the small town of Baena (population 20,000), which has become famous for its excellent olive oil. We visit the local Museum of Olive Oil, or the best working olive-oil mill in the Cordoba province. We leave Baena and after riding about 20 km on small, curvy rolling roads through yet more olive groves, we join one of the most beautiful Spanish green roads – the Olive Oil Green Bike Road/Path (Vía Verde de Aceite). This bike path was built on a former railroad track and takes us through the Provincia of Jaén and its hills covered with olive and cork trees. We cross several viaducts with magnificent views of small rivers and valleys, and ride through two former railroad tunnels. The path takes us all the way to Jaén, where we need just a short ride through this city to get to our hotel. Jaén is often overloooked by visitors to the region, which is a pity because it is a beautiful city with rich architecture, history, and also great tapas bars and Flamenco tradition. After breakfast, we set out once again on small roads and head towards the Renaissance jewel of Baeza. While today’s stage is short, it takes us through some dramatic terrain of yet another National Park, the Sierra Mágina. A few long climbs are definitely worth the effort – you are rewarded by breathtaking views of this mountain range and several long downhill rides. When we arrive in Baeza, a tour guide will lead us through the city to discover its many many charms. Our hotel for tonight is a former palace converted into a hotel. It has a magnificient patio and beautiful architecture. Today’s stage is the longest one on our trip. For those who do not feel like riding the entire stage, our support van is available and ready to do some “shuttling”. Hilly terrain alternates with flat sections as we slowly approach the great Sierra Nevada region. The views of this mountain range that we have almost all day are truly amazing. The Sierra Nevada is the highest mountain range in Spain and is the southernmost area with ski resorts in Europe. After a long day we arrive in Guadix. As most Andalucian towns, Guadix has a beautiful, architecturally rich, and easy to navigate center. However, it is most famous for its cave dwellings. Even today, about 3,000 town inhabitants live in these dwellings. Overnight we stay in one of these “caves” that has been converted into a hotel. The hotel has a pool and gorgeous views of the Sierra Nevada mountains. Guadix is also famous for its excellent (and mostly free) tapas. A relatively short ride with one major climb (we climb to the highest point of our bike tour – an elevation of 1,297 m) and a 25 km downhill through the “foothills” of the Sierra Nevada takes us to the heart of Andalucía and the Sierra Nevada – the magnificent city of Granada with its unbeatable and unimaginably beautiful Alhambra Palace. Our hotel is located just a short walk from this former seat of Jewish, Arab, and Christian rulers. We enjoy a tour of this “must see” historical world wonder in the afternoon just in time for our goodbye dinner in the evening. After breakfast, our trip is officially over. Since Granada has a lot to offer besides the Alhambra, we encourage you to stay at least one more day. 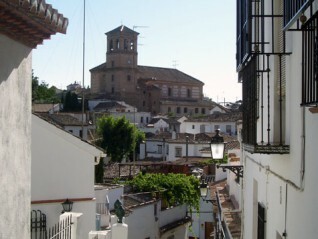 Besides its architecture, the city is also famous for the largest and best tapas in the country and for its bull fights. You should come well prepared for the trip and you should be an experienced rider. For full enjoyment of the trip, you should come prepared to complete the 80-100 km / 50-65 mile days comfortably on moderately hilly to hilly terrain. You should be able to complete several climbs on the route. While most of them are under 2.5 km (1.5 mile), there are some that are longer. You also need to know how to descend long and sometimes steep down hills and how to properly use your brakes! We try to design our route along small, quiet, and picturesque roads with little car traffic and/or bike paths that enhance our sightseeing of the local areas. For the most part road surfaces will be of good quality but there are a few short sections of patched road where you need to ride with increased care. Road bikes as well as touring bikes and hybrids are suitable for the tour. Seville is serviced by San Pablo Airport, located 10 km (6 miles) northeast of the city center. There is both taxi and bus service available from the airport to the center of Seville. For an extra fee, we also offer a pick-up service from the airport the day before the bicycle tour starts and on Day 1 of the bike tour in the morning. When flying from overseas, you will most probably have to change flights in Madrid or Barcelona. The flight from these two cities to Seville takes just 1 hour. 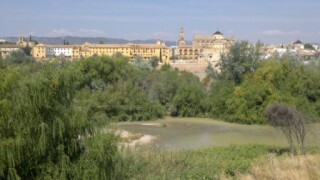 Granada is serviced by Fredrico Garcia Lorca Airport located 16 km (10 miles) west of the city. Shuttle buses and taxi service are widely available from the center of Granada. If you are heading overseas, you will once again have to change planes in Barcelona or Madrid. Your rental bike comes with a rear luggage rack, bungie cord, extra tube and levers, water bottle cage, pump, lock, and odometer. The price for renting a bike for this bike tour is $200 for Fuji Absolute or $270 for Fuji Newest or Fuji Roubaix. * Our expenses are mostly payable in Euros. Because of the constant fluctuations in currency rates, we reserve the right to increase the trip price. The trip price may increase depending on the currency exchange rate of the Euro to the USD and/or AUD at the moment of your final payment. The trip price shall increase if the USD/Euro exchange rate exceeds 1.20 and/or AUD/Euro exchange rate exceeds 1.60.